by Contant, Terry L.; Bass, Joel L; Tweed, Anne A; Carin, Arthur A. This package includes the Enhanced Pearson eText and bound print book. 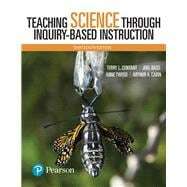 Teaching Science Through Inquiry-Based Instruction provides theory and practical advice for elementary and middle school teachers to help their students learn science. Written at a time of substantive change in science education, this book deals both with what’s currently happening and what’s expected in science classes in elementary and middle schools. Readers explore the nature of science, its importance in today’s world, trends in science education, and national science standards. The Thirteenth Edition is expanded to include information about the Next Generation Science Standards (NGSS) Performance Expectations for all elementary grade-level activities as well as the National Science Education Standards (NSES). Additionally, the book strives to present manageable ways to successfully bring inquiry into the science classroom by relating A Framework for K-12 Science Education: Practices, Crosscutting Concepts, and Core Ideas and the 5E Instructional Model. Each chapter ends with suggested discussion questions and professional practice activities to encourage reflection and extend learning. New NGSS-aligned classroom activities provide examples of instruction that interweave the three dimensions of science. The Enhanced Pearson eText provides a rich, interactive learning environment designed to improve student mastery of content with embedded videos, assessment quizzes, and an activity library. Terry L. Contant is the Science Curriculum and Instruction Specialist at LEARN, the Regional Educational Service Center for southeastern Connecticut. She holds a BA in Natural Sciences from Case Western Reserve University and a MA and Ed.D. in Science Education from the University of Houston. Her work at LEARN includes, science-focused professional development and curriculum development for schools and districts in collaboration with the CT Department of Education in their efforts to implement the Next Generation Science Standards. Recently, to help schools “STEM-ify” their programs, she led the development of an online course designed to help educators understand the importance of STEM, the shifts brought by NGSS, and tools and strategies for setting up and operating a STEM program for K-8 learners. Over the years, she has taught science in grades K through 9, been a museum and planetarium educator, worked as a district-level science coordinator, written and served as principal investigator for both state- and federally-funded science education grants, taught elementary science methods to preservice teachers, and supervised student teachers. Throughout her career in science education, Contant has been an active member and leader in many organizations that support science educators including the National Science Teachers Association (NSTA member for 38 years) and Connecticut Science Teachers Association (President 2012-2014). She has been a co-author for the four most recent editions of this long-running science methods text: Teaching Science as Inquiry 10th Edition, Pearson, 2004; Teaching Science as Inquiry 11th Edition, Pearson, 2009; Teaching Science Through Inquiry and Investigation, Pearson, 2015, and Teaching Science Through Inquiry-Based Instruction 13th Edition, Pearson, 2018. Anne L. Tweed, is the Director of STEM Learning with McREL International in Denver. She holds a BA in Biology from Colorado College and an MS in Botany from the University of Minnesota. Her work at McREL includes educational research, curriculum development and professional development related to science, math and STEM teaching and learning. She also provides technical assistance to districts and state departments of education around developing and implementing the Next Generation Science Standards and project-based STEM initiatives. Ongoing professional development workshops feature effective science, engineering and math instruction, designing effective science lessons, developing Next Generation Science Standards (NGSS) lessons and implementing formative assessment effectively in CCSS aligned Middle School mathematics classrooms. A 30-year veteran classroom science teacher, Tweed is also a past-president of the National Science Teachers Association (2004-2005). She has published many articles, authored and co-authored several books (Designing Effective Science Instruction, 2009 and an Australian version in 2014), most recently she has co-authored with Susan Koba the second edition of the Hard-to-Teach Biology Concepts (2014) book, published by NSTA and incorporating the NGSS. Tweed has provided numerous webinars and conference presentations on the instructional shifts and changes in lesson design resulting from CCSS and NGSS. Joel E. Bass, Professor Emeritus of Education at his retirement in 2000, enthusiastically taught science and science methods for 35 years at Sam Houston State University in Huntsville, Texas. Dr Bass held a BA from Baylor University, an MS from Sam Houston State University, and a Ph.D. from the University of Texas at Austin. While he was a professor, Dr. Bass inspired many future elementary and middle school teachers to make science teaching part of their classroom practice. He touched thousands more through his work on the ninth, tenth, and eleventh editions of Teaching Science as Inquiry. Though Joel passed away after completing the eleventh edition, his passion for science teaching lives on in this book. Arthur A. Carin, served as a faculty member at Queens College for 33 years until his retirement as Professor Emeritus in 2003. Dr, Carin earned an undergraduate degree at State University of New York, Oswego; a masters degree at Queens College, and an Ed.D. at the University of Utah. Dr. Carin was the author of the first eight editions of this text (then called Teaching Science as Discovery). Through five decades of exemplary writing, research and service, Dr. Carin had a significant, positive impact on science education. He died in 2003, but his legacy continues through his work.